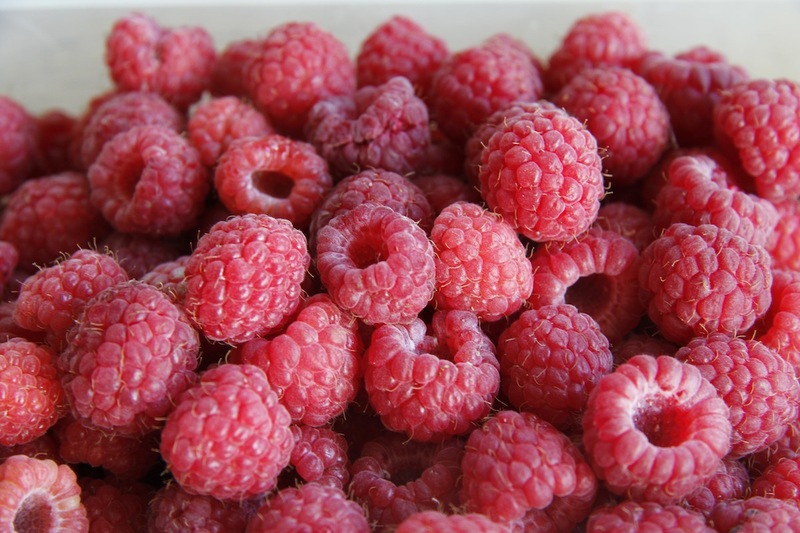 We have summer raspberries at the moment. We don’t have many vegetables as I was delayed planting due to the op but we have some fruit (raspberries, strawberries and gooseberries with redcurrants about to be ready any day now). Actually the salad stuff: radishes, lettuce, rocket and cucumbers are coming along. So, as I had raspberries I made some little raspberry tarts from Dan Lepard’s lovely book Short and Sweet: the best of home baking (378). Some were for a friend’s birthday and some were for friends visiting. The custard base that uses flour rather than egg yolks for thickening was a revelation. I loved these – they were light, but creamy, and the pastry provided a nice crunch. The only change I made to the recipe was that I didn’t crush the raspberries with sugar – I thought they were sweet enough so just popped them on top. 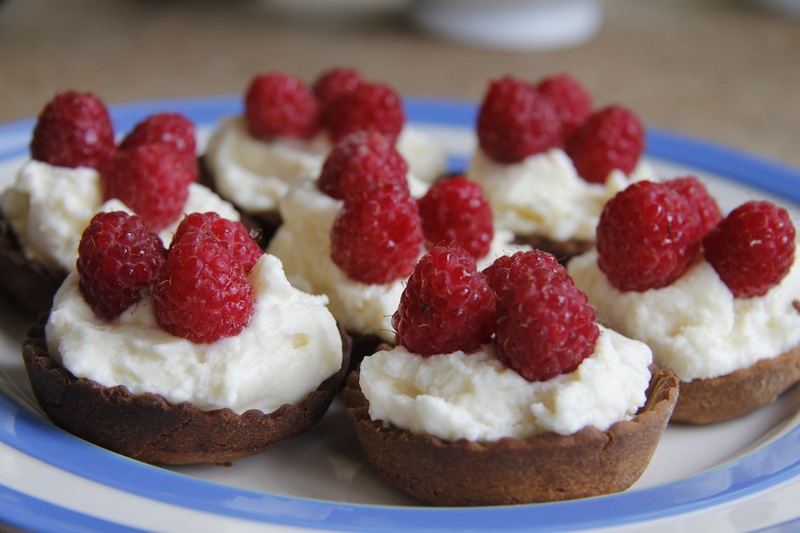 Little Raspberry Tarts: 1 quantity of sweet shortcrust pastry (250g of plain flour, 50 g icing sugar; pinch of salt; 150g of butter; 2 egg yolks, 1 tbs iced water); 325ml of milk; vanilla, 75g of caster sugar; 3 tbs of plain flour; 2 egg whites; 300ml of double cream; raspberries. 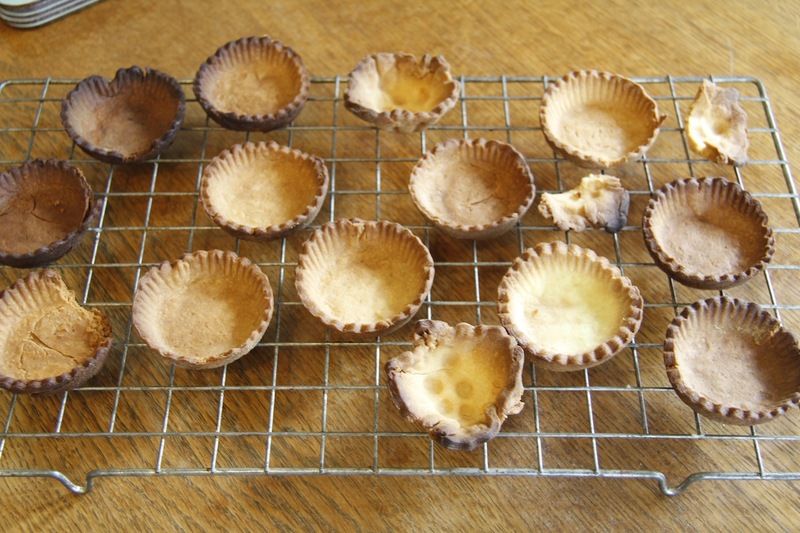 tart cases – as you can see one side of my oven is hotter than the other! For the pastry tarts: process the flour, icing sugar and butter until it resembles fine breadcrumbs. mix the egg yolks and water together, add and process until the pastry starts to come together. Pat into a ball, wrap in clingfilm and refrigerate for at least 30 minutes to let the pastry rest. The pastry can stay in the fridge for a few days – with no adverse affects. Roll out the pastry and cut out circles to line a small tart pan – the individual tarts can be quite shallow. Bake for 20 minutes or so until they are golden brown and then cool on a wire tray. For the custard cream: heat up the milk. Whisk together the flour, egg whites and sugar until smooth. Pour on the hot milk and continue to whisk. Put the mixture back in the saucepan and bring slowly to the boil and simmer for a few minutes until it has thickened. Sieve into a bowl, cover with a plate and leave to cool. When it is cool, whisk the cream until thick and fold into the custard. 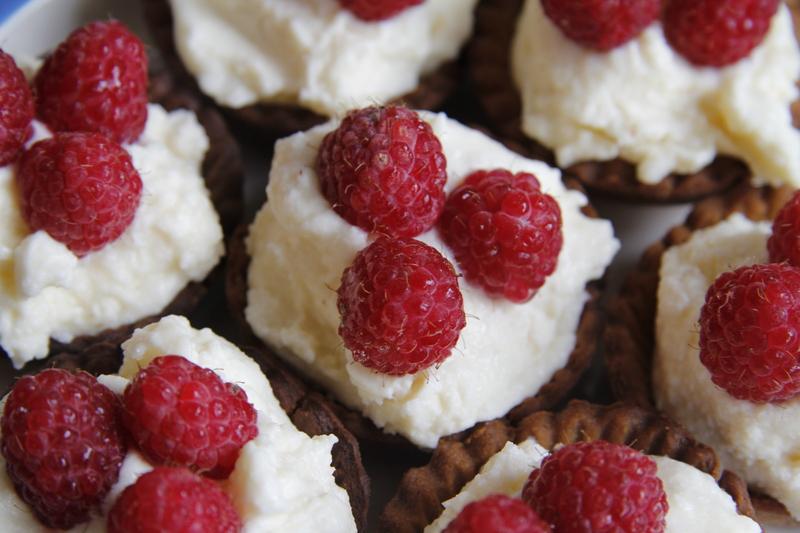 To serve, add spoonfuls of the custard cream tot he tart cases and top with raspberries.